Spread team colors and spirit with official San Antonio Spurs license plates that are sure to be a big hit amongst fellow fans. 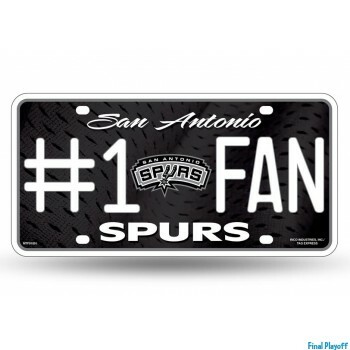 Shopping for the right metal San Antonio Spurs license plate is easy with embossed designs to choose from. Plastic diecut San Antonio Spurs license plates are popular with pre-drilled holes for easy mounting on walls or doors being light weight. All San Antonio Spurs orders are processed and marked for shipping same business day Monday through Friday 9:00am to 6:00pm pacific time excluding holidays and weekends. Rest assured knowing that your sports team merchandise is packed and shipped in house for an error free delivery. Check out other fabulous items in our catalog and bookmark our site for a future return on updated new arrivals.